The Solution below shows the 6th note intervals above note F#, and their inversions on the piano, treble clef and bass clef. This step shows the F-sharp sixth intervals on the piano, treble clef and bass clef. This table inverts the above intervals, so that each link in the last column leads to note F-sharp. This step constructs the F-sharp major scale, which is necessary because all interval names in this key are calculated using this major scale as starting point. The tonic note - F# ,shown with an asterisk (*), is the starting point and is always the 1st note in the major scale. 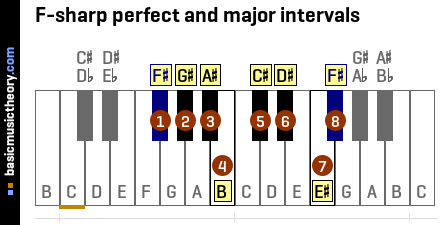 The table and piano diagram below show the 8 notes (7 scale major notes + octave note) in the F# major scale together with the interval quality for each. Using just the notes we have in the major scale above, a chord spelling of 1 3 5 uses the 1st, 3rd and 5th notes as they are, ie. the F# major chord. Or a 1 3 5 7 chord adds the extra 7th note, ie. the uses the 1st, 3rd and 5th notes as they are, ie. the F# maj 7 chord. This rest of this page will focus on the relationship between the tonic note - F#, and the intervals surrounding the 6th major scale note - D#, whose interval quality is major. So we will definitely see extra sharp or flat spelling symbols there. 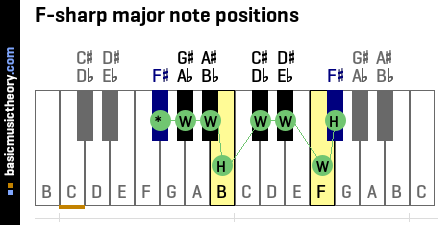 This step identifies the note positions of the F-sharp 6th intervals on a piano keyboard. Having established that the major 6th interval of the F# major scale is note D#, this step will explore the other 6th intervals next this note. 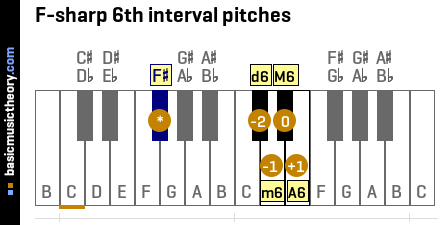 This step identifies the note names of the F-sharp 6th intervals on a piano keyboard. 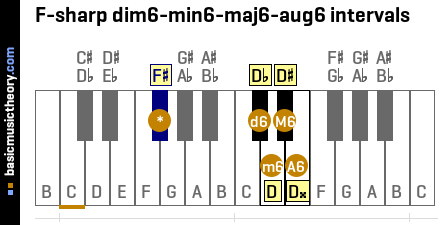 The major 6th note name is D#, and so all intervals around it must start with the note name D, ie. be a variation of that name, with either sharps or flats used describe the interval difference in half-tones / semitones from any given interval note to the major 6th. 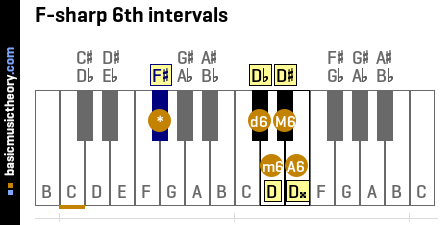 This step explains how to invert note intervals, then identifies the F-sharp 6th inverted note intervals shown in previous steps. For example, in the steps above, one of the intervals we measured was a major 6th above F#, which is note D#. In contrast, an inverted interval specifies the distance from D# to F# - ie. note F# is above note D#.